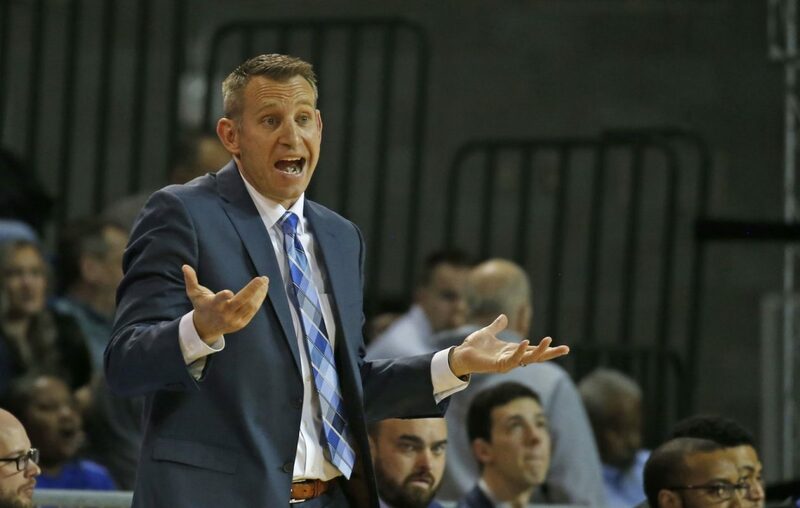 DEKALB, Ill. – The shock was still palpable as Nate Oats and members of the University at Buffalo men’s basketball team entered the post-game press conference and sat down at the podium. Moments after Noah McCarty’s layup with two seconds left in regulation handed the Bulls a 77-75 loss Tuesday at Northern Illinois, UB's coach and players tried to fathom what had just happened. The No. 14 Bulls (17-2, 5-1 MAC) hadn’t lost a game in more than a month. They are now in second place in the MAC East behind Bowling Green, which is 6-0 in conference play. Harris and teammate CJ Massinburg wore long faces. Their eyes were downcast as they answered questions about how and why the Bulls lost to an unranked opponent, their first loss to an unranked opponent since Feb. 20, 2018, when they fell 84-81 at Miami (Ohio). Massinburg scored a team-high 23 points and helped the Bulls wipe out a six-point deficit in the final 52 seconds. Massinburg made three free throws with 48 seconds left, then tied the game at 75 on a 3-pointer with 11 seconds left in regulation. But off the ensuing inbounds play, Trendon Hankerson dribbled down court and found McCarty, a 6-foot-8 forward who cut between a pair of defenders in the paint and dropped in a layup with two seconds left. Fans rushed the court at the Convocation Center, thinking that time expired after McCarty’s successful shot, but officials put less than a second back on the clock and ordered the masses back to their seats. Fractions of a second later, the fans rushed the court again as the buzzer sounded to seal Northern Illinois’ first win over a ranked opponent in nearly 46 years, when the Huskies beat No. 19 Oral Roberts on Feb. 3, 1973. One shot at the end of regulation didn’t foil the Bulls, though. Subpar shooting plagued them, and UB finished 22-for-60 from the floor, including 9-for-30 on 3-pointers. The Bulls also turned the ball over 17 times, the third consecutive game in which UB has had at least 14 turnovers. UB averaged 11.4 turnovers per game prior to Tuesday. Northern Illinois (11-8, 4-2) kept UB’s shooters off balance most of the night and played aggressive basketball that hindered the Bulls. The two teams combined for 17 fouls in the first 9 minutes, 36 seconds; UB guard Davonta Jordan committed his second foul 4:19 into the game and Nick Perkins was called for his second about three minutes later. With UB ahead 31-29 with 2:58 left in the half, Huskies guard Dante Thorpe (23 points) and Jayvon Graves traded 3-pointers in a span of 36 seconds. After Thorpe missed both free throws inside the 3-minute mark, the Huskies answered off transition as McCarty tied the game at 31. NIU closed the first half on a 9-1 run in the final 2:29, capped by Hankerson’s layup with seconds remaining, giving the Huskies a 38-32 lead at the half. It was the first time in more than a month that UB trailed at the break. Marquette led UB 39-38 at halftime of a 103-85 win Dec. 21 in Milwaukee. Perkins’ 3-pointer five minutes into the second half sparked a 14-4 run for the Bulls, helping them tie the game at 52 on Graves’ free throws with 12:10 left. Yet with solid defensive rebounding and clutch shooting down the stretch, the Huskies opened a 71-66 lead with 1:47 remaining. Then, tied at 75 after Massinburg’s six points, McCarty hit the decisive shot. “We were supposed to switch,” Oats said of McCarthy’s game-winner. “They set a nice back screen. It was hard for CJ to get there. It was a good play. We didn’t get our rotation over there, and once guys saw what was going on it made it a little harder.